Fall is officially here, and along with all of you my mind is turning toward all things pumpkin. And since it is Monday I decided that life is too short not to start with dessert first! 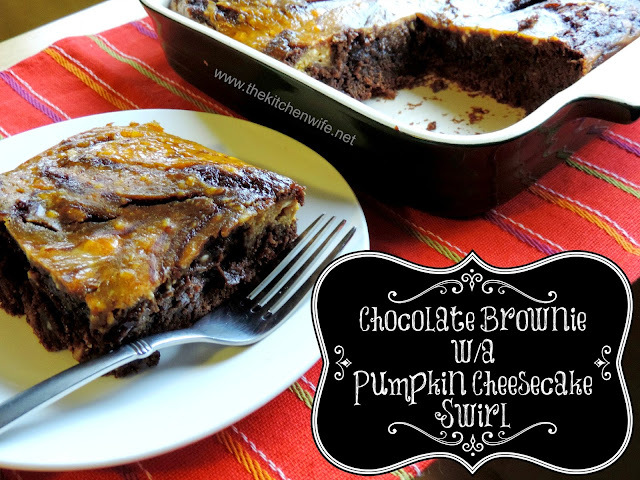 So in the spirit of fall, dessert, and all things pumpkin, I present to you my recipe for a chocolate brownies with a pumpkin cheesecake swirl! Oh yes, I did! And you are going to love it! Let get started assembling this shall we? You will want to add the flour, cocoa, baking powder. sugar and salt to a sieve. Sift all of the dry ingredients together into a large mixing bowl. Using a rubber spatula, gently mix and fold the batter together. This will be a dense batter and you don't want to over mix it by using a hand mixer. To a greased baking dish, add the batter. Not it is time to assemble the swirl! The cream cheese, vanilla, and pumpkin pie spice. Now, I feel a responsibility to throw this out there. You will notice little white clumps in mine. This happened for two reasons. One, my cream cheese was not at room temperature, so instead of blending into the mixture, it kind of clumped. And two, I was too lazy to get out the mixer, and used a whisk to mix it. Pour the pumpkin cheesecake mixture over the brownie batter and gentle spread it across the top. Now use your butter knife and drag it top to bottom, left to right through the batter. Don't be afraid to really get in there. Remember, this is a very thick and dense batter. When it is ready it will look a little something like this. Now place in the preheated oven for 20 minutes. After 20 minutes, remove from the oven, cover with foil, (I like the spray it with non-stick spray to keep it from sticking), and place back into the oven for another 15-20 minutes. Remove the brownie from the oven and allow to cool for 10 minutes. Look at that GORGEOUS swirl! YUM!!! MMMMM....This brownie is flaky and moist! It has that great chocolate flavor we love along with that Pumpkin flavor we all long for this time of year! And you made the ENTIRE thing from scratch! Your family is going to love it!!! So get in the kitchen and get baking. Combine the flour, sugar, cocoa, baking powder, and salt in a sieve. Sift into a large mixing bowl. To the dry ingredients add the vanilla, eggs, and oil. Mix and fold the batter together using a rubber spatula so that you do not over mix. For the pumpkin cheesecake swirl, add the puree, cream cheese, egg, sugar, and vanilla to a bowl and mix together. Pour the pumpkin over the brownie batter and gently spread around. Using a butter knife swirl in the pumpkin to the batter, top to bottom, and side to side. You will see the swirl take shape. *Spray the foil with non-stick spray to keep it from sticking.